Sledding is always a fun activity for people of all ages. It's fun, good exercise, and allows you to get vitamin D during the winter. Sledding can actually burn more than 450 calories per hour since you usually have to walk up a hill once you get to the bottom of it. Other studies found that sled riding is a great way to de-stress. In other words, sledding has more health benefits than you can imagine. But what happens if you don't have a sled? Although sledding is relatively inexpensive, sometimes sleds can be a little pricey. If you can't afford a sled at the moment, that doesn't mean you have to miss out on all the winter fun. Today, I'm going to go over some creative sled alternatives that you can easily make from household items. Let's get started. One of the most common items used for making makeshift sleds is tarps. A tarp is slippery enough to slide down a hill and it is usually large enough to fit a lot of people. Keep in mind that if the snow is soft, your tarp may not go down the hill as fast. Also, if the snow is too icy, your tarp may rip. Surprisingly, a laundry basket is perfect for sledding. Make sure the laundry basket isn't too high because you want to be able to jump out of the sled if needed. Also, decide how big you need your laundry basket to be. A smaller laundry basket is a great sled option for young kids, but adults may need something a little bigger. If you have any knee issues, it may be difficult to get in and out of a laundry basket. Do you have an old baby pool that you have been meaning to get rid of? Don't throw it away just yet! Old baby pools are perfect for sledding. Depending on how big your baby pool is, you may be able to fit lots of people on this "sled". Whatever you choose to do, this is definitely a great use for your baby pool during the winter. Just because summer is over doesn't mean that you have to put away your inner tubes. Even though you can't use your inner tubes in the pool anymore, you can certainly use them on the snow. 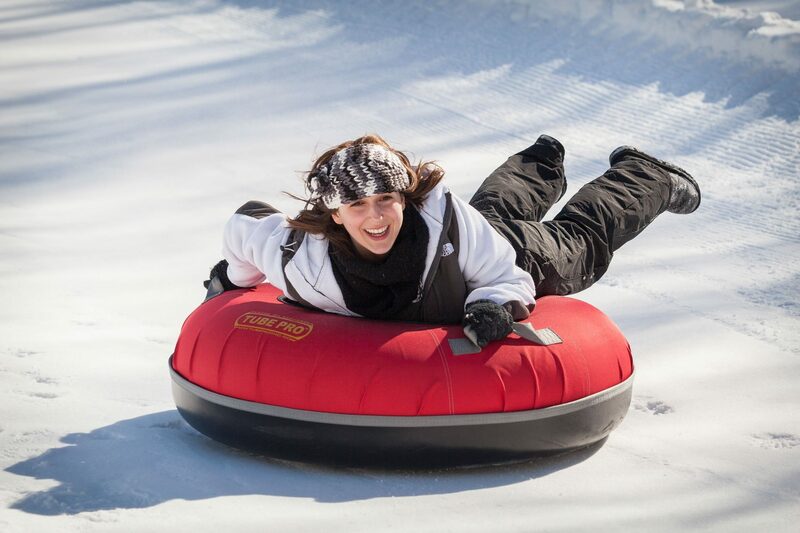 Inner tubes are perfect for sledding because they slide well and they are easy to jump out of. Even if you have an old inner tube that doesn't have air in it, you can still slide on it. Of course, you probably won't want to try this sled idea with your best coat. But if you happen to have an old coat, consider using it as a sled. To make it slide down the hill better, wrap it in plastic. A shower curtain is perfect for sledding. Shower curtains work well on smooth and icy snow. If the snow is too soft, the shower curtain may not slide as well. If needed, you may need to put a plastic bag over your shower curtain. Borrow the lids off of your trash cans and use them for sledding. If the trash can lids aren't slippery enough, you can put them inside a garbage bag. These lids come in many different shapes and sizes, so each kind may slide a little differently. If a trash can lid doesn't work, consider using a lid from a plastic bin. If your plastic bin lid isn't completely flat, it may not slide down the hill as good. Wrapping the lid in a garbage bag will help make it more slippery. A yoga mat is another great sled alternative. 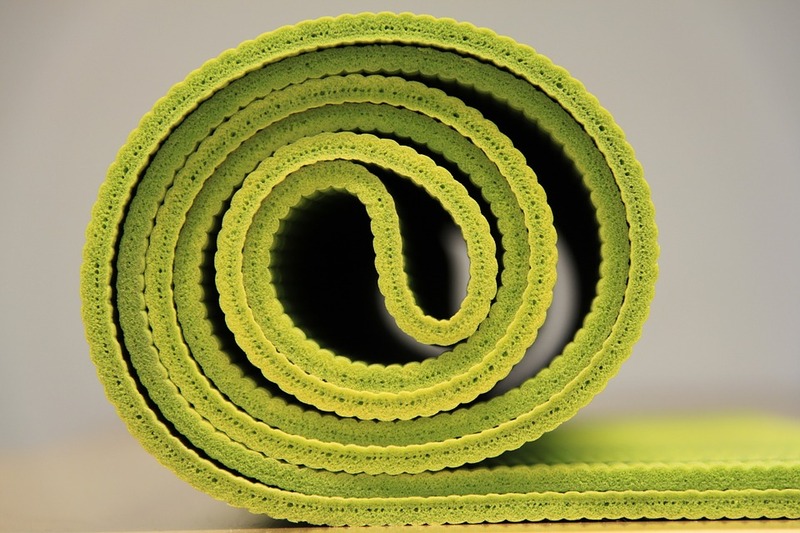 If possible, choose a yoga mat that is extra thick and anti-tearing. This will prevent the yoga mat from tearing while you are riding it. Yoga mats are pretty long, so you may be able to fit multiple people on it. Do you happen to have a sleeping bag that you used during camping season? Consider using it as a sled for sled riding. If you are feeling brave, you can sit or lay inside the sleeping bag. Otherwise, simply sit on top of the sleeping bag and slide down the hill. A cookie sheet or cafeteria tray is perfect for sledding. They are flat on the bottom, which means they will slide down a hill very quickly. You can always place it inside a trash bag if it isn't fast enough. Unlike a regular mattress, an air mattress is lightweight and portable. This type of mattress is often used during camping season due to its portability. It is filled with air, which is what makes it so lightweight. If you happen to have an air mattress, you may want to consider using it for sledding. Multiple people should be able to ride on an air mattress, as they can be as big as a king-sized bed. Garbage bags are another easy and cheap option for sledding. To ride in a garbage bag, simply put your feet in the garbage bag. Make sure no clothing beneath your waist is showing, as this could slow you down. If you will be using multiple garbage bags, you'll need to hold all of them so that they don't rip or get away from you. If you happen to have a dog bed, this will make a great sled. Simply place it inside a garbage bag and sit on top of it. Depending on what the dog bed is like, you may not need the garbage bag. But the garbage bag does help make the bed more slippery. 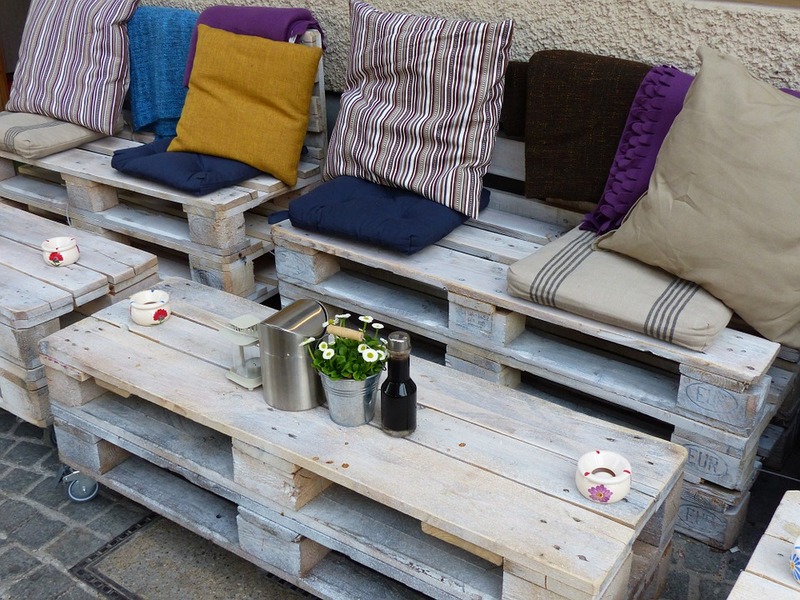 The cushions on your outdoor furniture are another sled alternative that you can try. There are multiple ways that you can sled ride on cushions. You could slide down on them exactly the way they are or you could place them in a garbage bag. You could also use them for sitting on when you ride on any of the other sled alternatives I've given above. What's nice about cushions are that they are comfortable and they help soften the bumps. Using a saw, cut a pallet in a half, but leave one of the supports on one side. To improve the displacement of the sled on the snow, cut the boards of the front part of the sled in order to have a soft curve on them. This DIY wooden pallet sled is perfect for sledding. You can easily make a homemade sled out of a cardboard box. Start by folding the box and taping the front flap down. Take the bottom flap in the front and pull it up to a 45-degree angle and tape it down so it will stay that way. Tape the other sides of the cardboard box as well. Then, lay your box on top of a garbage bag and begin folding the garbage bag around the box. Tape the garbage bag to the box so that it will permanently be on there. This is what makes the cardboard box slippery. Once you are finished, you can decorate your homemade sled with decorative tape. 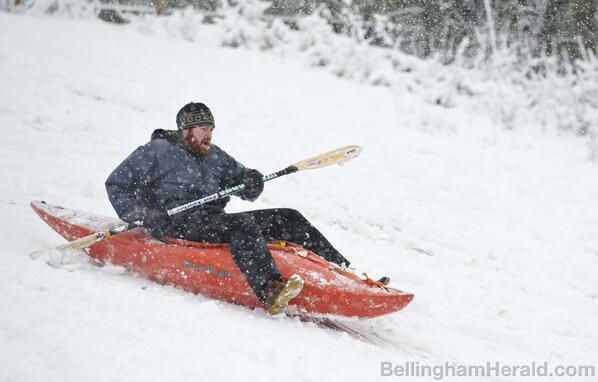 A kayak is hard to direct in the snow, but it is still a fun way to sled ride. You may be able to fit a couple of people on board. Just make sure that you have some way to stop if you have to! A folding table is another easy makeshift sled you can use. Simply fold the table and ride on top of it. Because a folding table can be heavy, you may need somebody to help you carry it up. There are so many fun activities to do during the winter. From having a snowball fight to building a snow fort, there are so many fun ways to get outside and exercise. One such way is to go sledding. 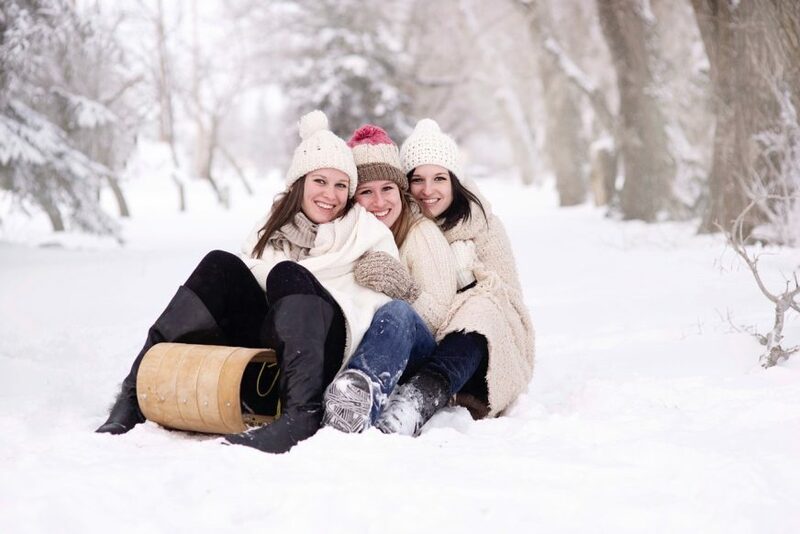 Studies have found that sledding is a great way to get exercise and de-stress during the winter. Besides, it also gives you a chance to get vitamin D. But if you don't have a sled, you may be wondering how you can still enjoy sled riding. Thankfully, there are many sled alternatives that you can use. In this article, I went over the best sled alternatives that are either homemade or used from household items. From using a cardboard box to using an air mattress, the ideas for sledding are endless. Some of these ideas, such as the folding table, can be difficult to carry up the hill on your own. Others, however, are lightweight and perfect for sledding. Hopefully, this article has inspired you to use one of these sled alternatives for when you go sledding this year. Have fun!